TD Canada Trust reminds you that it has more than 100 years of experience in helping newcomers to Canada. Check out the excellent New to Canada package which offers to set up the important elements of a financial foundation, especially designed for the special needs of newcomers, from free checking accounts to credits cards for those who haven’t established a credit rating. The Money Matters workshops are supported by two informative booklets. 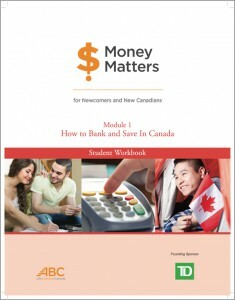 Module 1 is called How to Bank and Save in Canada and Module 2 is How to Build Credit in Canada.